I am so happy this stamp and die set made it to the new catalog. It is a great stamp set that has lots of used for men and ladies. We embossed the bird in gold to give it a little pizazz and water colored the images in. 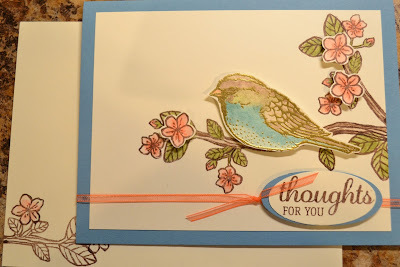 This great card was shared at card club.... wait till you see what June will bring! Stamp Set Best Birds. The link will more inlikey change after June 1st. So if you are having trouble locating this, use the search box for Best Birds. The set and die are sold individually after June 1st.